Families are highly encouraged to download and read our 2019 Camper Transportation Quick Facts for a complete run down of our transportation systems. Please contact transportation@ramahoutdoors.org with any questions about your child’s travel arrangements. Flights should land in Denver between 9:00 am-11:30 am. Flights should depart Denver between 10:15am-3:00pm. There will be campers wearing their 2019 camp shirts arriving from all over the US and overseas at Denver International Airport. 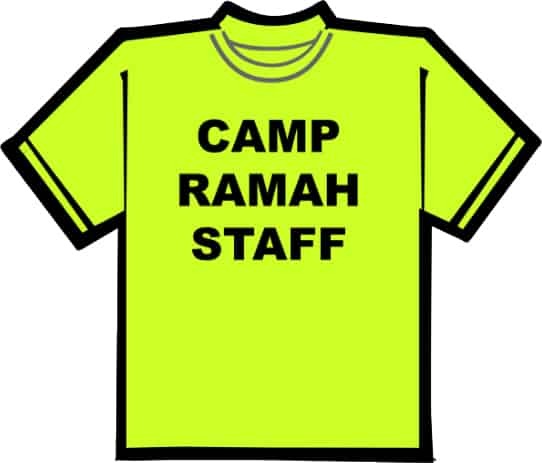 Campers should look for Ramah in the Rockies staff wearing bright, neon shirts that say “Camp Ramah Staff” (pictured). We will have teams of madrichim (counselors) at the airport to meet campers at their gates. If your camper is arriving within our flight window, please instruct them to wait in the gate area. Many flights arrive very closely together and our staff may just be a few gates down meeting other campers before coming to your child’s gate. Campers and staff will then go together to baggage claim, where staff will help campers to claim their luggage. If your camper is mature enough to go to baggage claim on their own, or if you are dropping your camper off at the airport, the Ramah Rally Point is located next to Baggage Claim #10 on the west side of the airport. 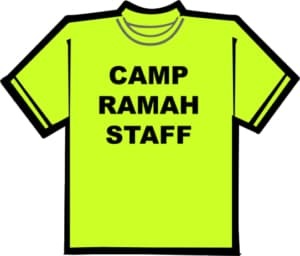 Ramah staff will be waiting here to meet campers also. We begin loading the shuttle buses around 12:00 pm, once all luggage is collected and verified. Campers will get a small snack in the baggage claim area and are encouraged to fill their water bottles. Box lunches will be served on the bus. Usually, we pack sunbutter and jelly sandwiches, apples, and nut-free trail mix. Our shuttle buses typically arrive at camp around 2:30-3:30 pm. 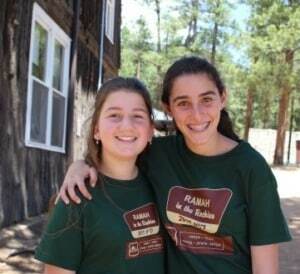 Campers will then check in and be welcomed by their madrichim. Please also include a change of clothing, sweatshirt, snacks for the flight, and any toiletries or medicine your camper might need on travel day in their carry-on bag in case your checked baggage is delayed. You may also want to give your camper a pre-paid ($25) credit card to use at the airport. Campers should wear their 2019 camp shirt and have their daypack with a filled water bottle, sun hat, and a sweatshirt with them. Plan to arrive at the Hebrew Educational Alliance (HEA) parking lot between 9:00-9:30 am. The shuttle bus will leave at 10:00 am. No lunch is provided, as they will eat lunch at camp. Campers will arrive at camp at 12:00 pm. They will then check in and be welcomed by their madrichim. The Hebrew Educational Alliance is located near I-25 and Hampden Blvd. The address is 3600 S. Ivanhoe St., Denver, CO 80237. Please email transportation@ramahoutdoors.org to receive driving directions. Campers may be dropped off at camp between 11:30 am and 1:00 pm, and picked up between 9:30 am and 11:00 am. Camp is approximately 1.5-2 hour drive from Denver. If your camper’s travel or UM (unaccompanied minor) status changes at any time before travel day, please update the online Travel Survey in CampMinder. We understand how nerve-wracking it may be between seeing your child(ren) off and waiting to hear that everyone has arrived safely. Although campers are welcome to call home from the Denver airport, our airport team’s primary focus is getting the campers from their arrival gates to baggage claim, collecting bags, loading them onto trucks, and ensuring all campers are on the shuttle buses for the ride to camp. Our staff will not be calling families from the airport. They will be in touch with our office to communicate any issues or to notify us of the shuttle buses departing the airport for camp. 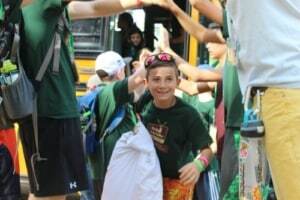 Once all of our campers have reached the chava (ranch), we will send an email to our camper families letting them know that everyone has arrived safely. Parents are welcome to be touch with our office at (303) 261-8214.